You are cordially invited to the 12th Annual San Diego County Sports Officials Hall of Fame Dinner! 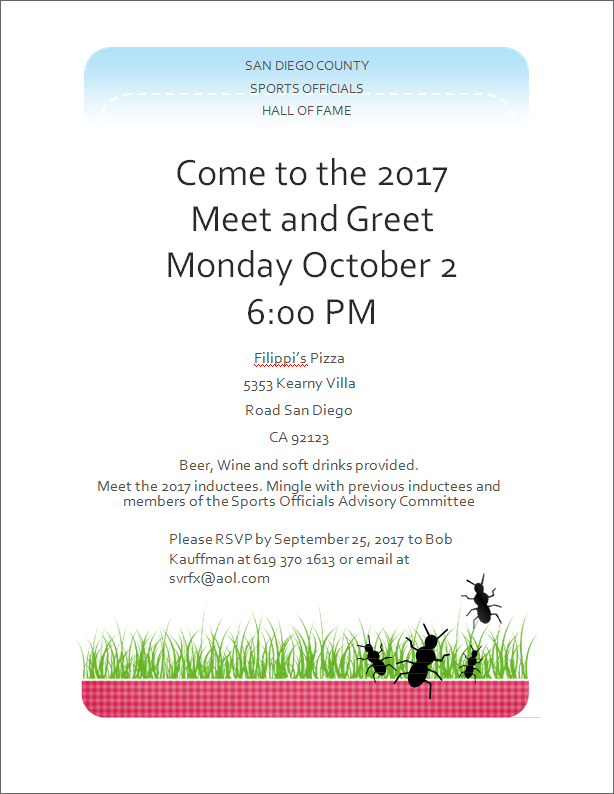 The Induction Dinner and Ceremony will be Tuesday, October 3rd at the Scottish Rite Event Center – 1895 Camino del Rio (South), San Diego CA 92108. Please join us for the induction ceremony at the Scottish Rite Event Center. A social hour will begin at 6:00 PM with dinner served promptly at 7:00 PM. The cost for members of an officials associations and one guest is $75.00 each or $750.00 per table. The cost for previous inductees to the Hall of Fame and one guest will be $60.00 each. The cost for all others will be $80.00. Your timely response would be appreciated as seating is limited. A portion of the ticket cost will be donated to the Sports Official’s Hall of Fame Exhibit Fund and is tax deductible (Tax ID # 46-2594740). You may contact Bob Kauffman at 619 370 1613 or by email at svrfx@aol.com for assistance in making reservations. If registering as an official, please provide the names of the Association(s) you belong to. Please list the names of the people who you are making reservations for. If you would like to be seated with specific people (besides the attendees you may have listed above), please list their names here.